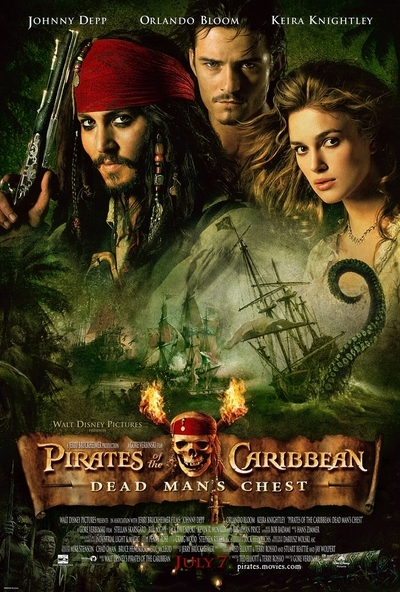 Story: Captain Jack Sparrow (Johnny Depp) discovers he owes a blood debt to the legendary Davey Jones, Captain of the ghostly Flying Dutchman. With time running out, Jack must find a way out of his debt or else be doomed to eternal damnation and servitude in the afterlife. Making matters worse, Sparrow's problems manage to interefere with the wedding plans of a certain Will Turner (Orlando Bloom) and Elizabeth Swann (Keira Knightley), who are forced to join Jack on yet another one of his misadventures.